Aesthetically, this could be filed under the “so bad, its good” category. In terms of various environmental and urban quality-of-life issues, this is probably quite disastrous. 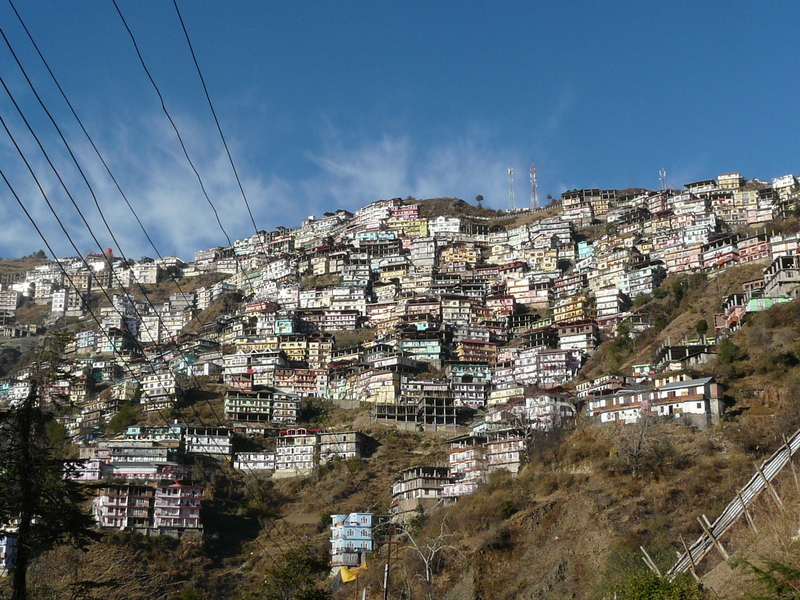 During colonial times, Shimla was the pearl in the necklace of “hill-stations” that the British had built all along the Indian Himalayas, to get away from the heat of the Indian summer down in the plains, and probably to seclude themselves from Indians as much as possible, other than those working directly for them. Shimla with its forested hills, crisp, clean air and European temperature had become the summer capital of the British empire in India, so much so that one of the reasons for moving their main capital from Calcutta to Delhi was the latter’s proximity with Shimla and the ease of moving the government from one to the other. One can only imagine how much the British hated Indian summers! Almost seventy years after independence however, Shimla is overcrowded, especially on weekends and during tourist season, its resources are strained and it’s no longer a fun, quiet weekend getaway. Instead there are traffic jams, crowds and garbage everywhere. 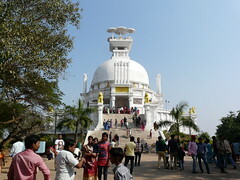 One of the best thing about tourism in India is the amount of domestic tourism there is. Indians from all walks of life travel near and far for the variety of experiences their country provides. The downside of this, with India’s burgeoning population and middle class, and abysmal implementation of city planning and urban laws, is unchecked growth to cater to this tourism. With all this, we have the situation seen in the photographs below. 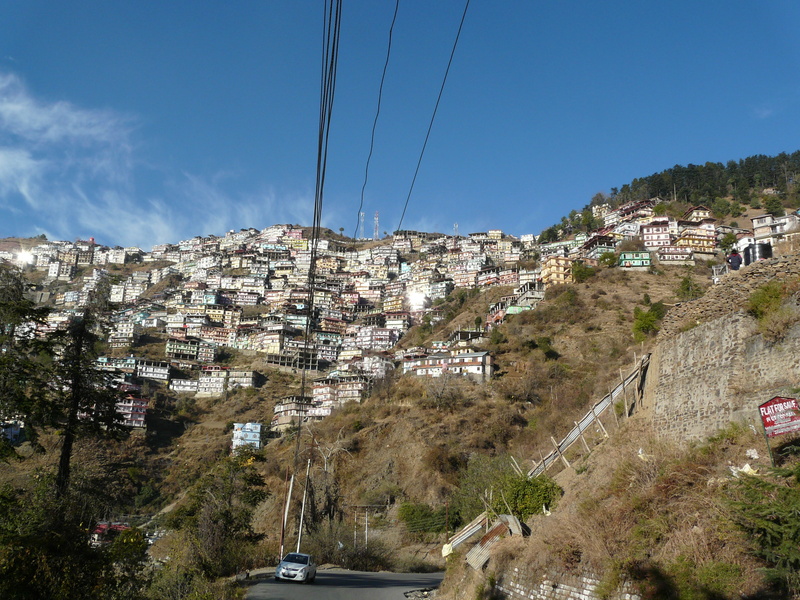 These photos are of Sanjauli, which can be called a suburb of Shimla. 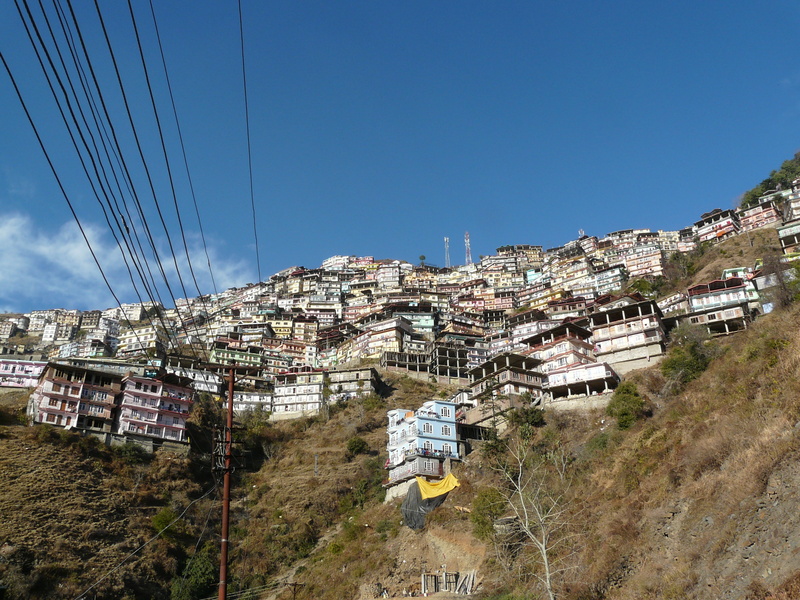 Entire hillsides, which should be covered with huge, beautiful and old deodar trees, are instead blanketed with these multi-storied buildings, most of which look like either apartments or cut-rate lodges that cater to domestic tourists coming to visit Shimla and its environs. More and more buildings are being built, with not a tree in sight between them. The next step would be to walk through the streets of Sanjauli to see what kind of urban environment and street-scape these buildings create. From afar, they look like a spectacular Himalayan dystopia, so ghastly that it begins to look beautiful. 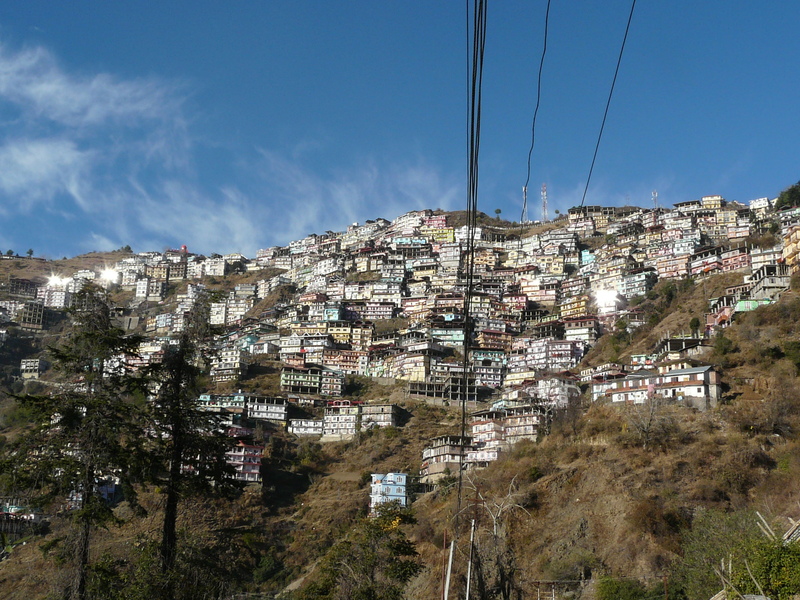 Of course examples of such urban morphological misadventures are replete in India, but the fact that this one is nestled in the Shimla hills, in the beautiful Himalayas, where just a few kilometers away are forests of huge deodars, and at such a large scale for the mountains, makes it all the more stark and surprising. The only solace that can be taken from all this is the fact that as soon as one turns from the crowded National Highway 22 that leads from Chandigarh to Shimla onto a smaller road, or travels on NH 22 just a few kilometers ahead of Shimla towards Narkanda, one can get a much richer experience of the Himalayan mountains and forests. And if one travels deep into the Himachal Himalayas, on narrow village-connecting roads where large SUVs will barely fit (which is why the Mahindra Bolero is so popular in the hills) one can experience sublime beauty (and even solitude!) 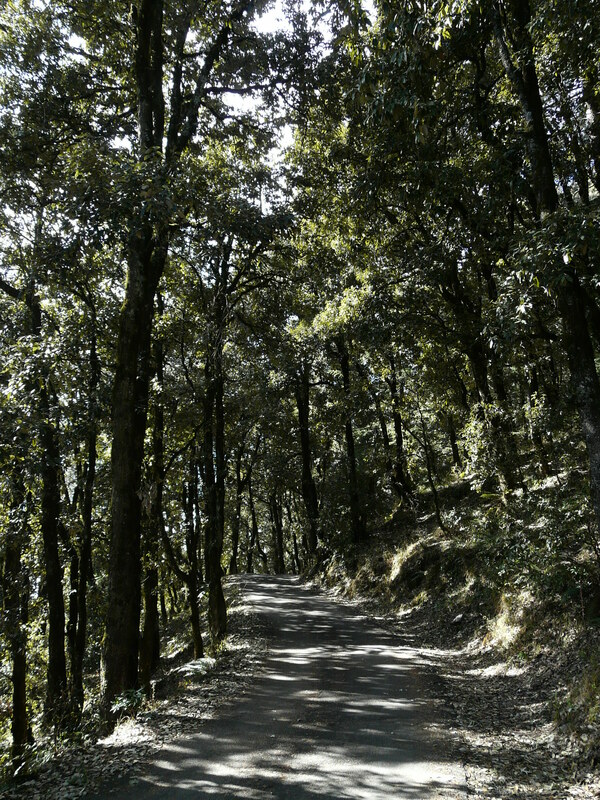 without even leaving a tarmacked road (photo below is of Himalayan Oak instead of deodars)! 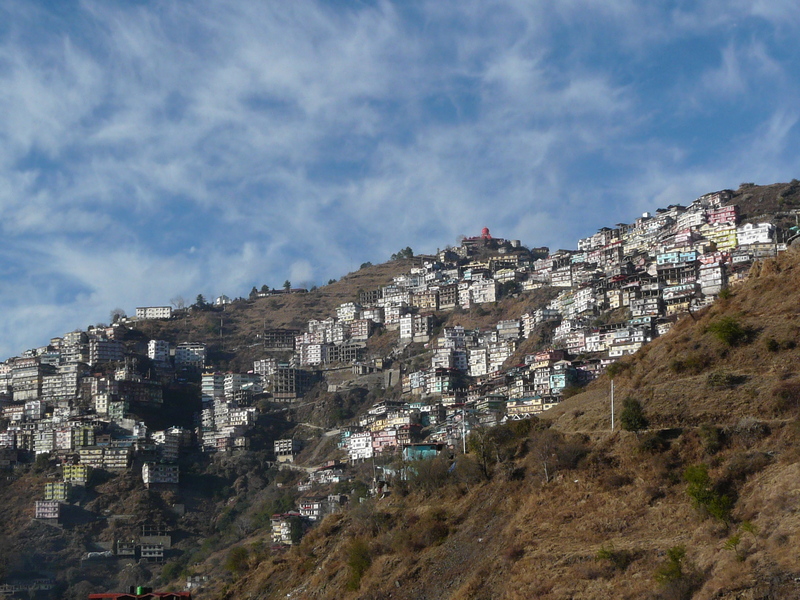 This entry was posted in Himachal Pradesh and tagged geography, himachal pradesh, shimla. Bookmark the permalink.